KEEP CALM AND CARRY ON: Things That Make Me Go "Woo-Hoo!" Things That Make Me Go "Woo-Hoo!" 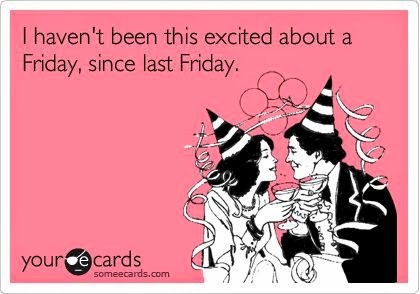 I hope you have some fun plans ahead of you this weekend! Mine is going to consist of trying to convince my husband to start cleaning out our basement together, so what that means is (besides pizza bribery) that if it works I'll be living vicariously through your fun. Cleaning out a basement full of stuff we need to donate is not my definition of fun, BUT hey on the bright side it is one less thing we have to do before baby K makes his arrival. Since I've had some people ask about our glider, I figured I would just go ahead and share it today when mentioning my favorites for the week. It's not the same color as what we ordered, but if it helps some of you on your decision making then of course I will share! I'm also pretty excited to introduce you to another Etsy shop for kiddos that you will adore...here we go! +Your newest favorite Etsy shop (mine too): BellaRoo Stitches & Designs! 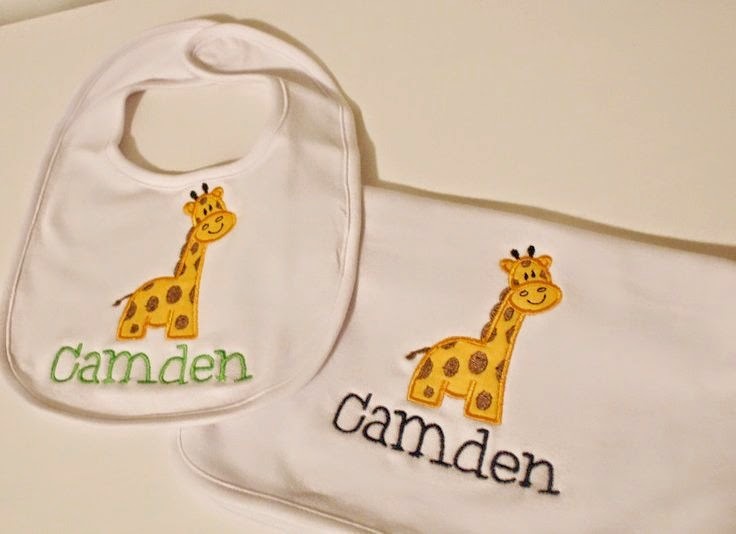 If you're looking for monograms and custom designed children's clothing and baby items, Jennifer is your gal! She designed these burp cloths and bibs for our little Cam that are just perfect. How cute are the giraffes?! I love them, plus the material is softer than you can imagine. Get your little kiddo (or future little kiddo..or friend who has a baby) some! see everything available in her shop: here! Yep...too cute for words. I absolutely love working with and finding new Etsy shops to love!! +One week of work stands between us leaving for Florida! The weather this week has made me realize that even though I thought I was ready for cooler temps, I'm NOT. The mornings have been chilly here lately and I can't help but feel like winter is creeping up way too soon, so yes...sunny Florida + the beach + days at the pool...here we come! 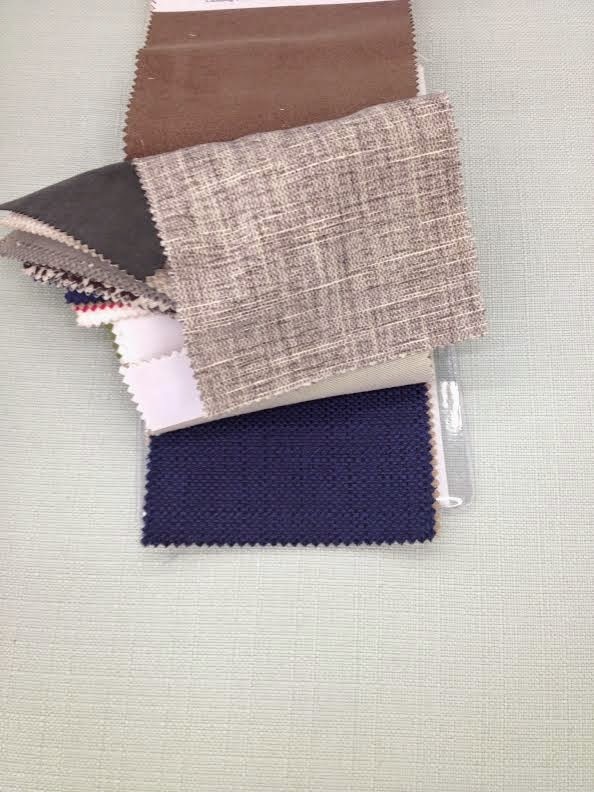 The gray fabric we picked! I have to say I'm really glad we decided to go with one that we actually sat in multiple times, versus finding one online and praying that it was comfortable/would fit in our room, so thanks to those who recommended that to us! There are so many differences between gliders and being able to actually see which ones fits the both of us (and to measure the room first) was the right way to go. +I can't for the life of me find cute decorative items, like to sit on bookshelves, for the nursery. Anyone have any recommendations? I've checked Hobby Lobby and Home Goods, but am running out of other ideas. 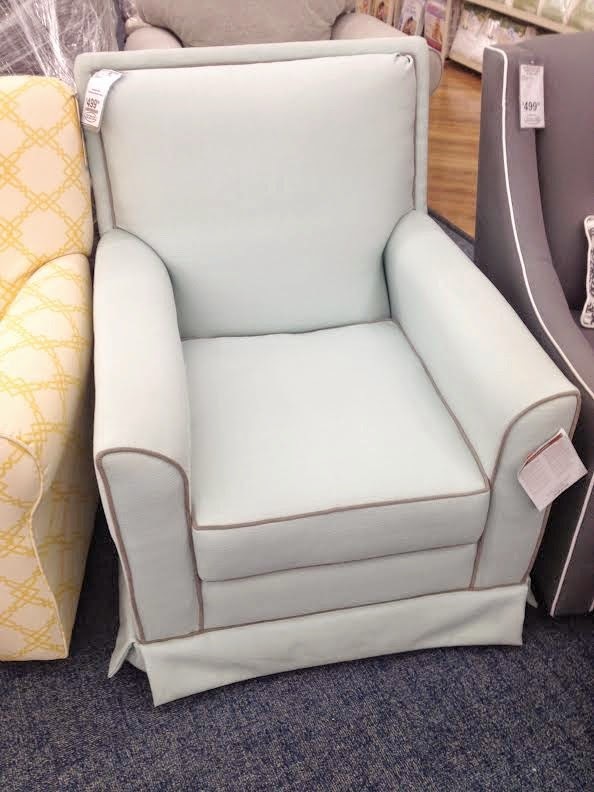 Where does everyone shop for cute nursery odds and ends?! Share your secrets! There is a PRECIOUS store called lilylimes in Worthington Hills that has perfect baby knick-knacks, gifts, and specialty items. We also found a few things at TJ Maxx. Will try to head there this weekend- thank you Audra! You always have the best suggestions! I love the little bib and burp cloth! Too cute! And LOVE your glider! I think we are going with one from Babies R Us just because we were able to actually try it out in person. Can't wait to see your nursery decor! I found a few things at Home Goods like a mini globe and a cute frame. That's about it! we don't have a ton of shelf space though. Jealous you will be in FL in a week! Right when it cools down here! Happy Weekend! Hi Kim! Yes, I've noticed that too! I love what you ended up with...and I know an elephant is in our future thanks to a friend so that's a good point. I hope I can find at least a couple more things! Same problem with decorative items. Of course my little one didn't give me my full run at it, but that's okay :) His nursery will get finished eventually...even though he's here!